Now that Amy and I have moved from NYC to San Francisco, it’s time for me to dig into the SF food scene. There are a number of cuisines that SF is reputed to do better than New York, Mexican being the most obvious, and I want to put these reputations to the test. Perhaps a little less obvious than SF’s Mexican superiority would be it’s Japanese, specifically regarding sushi. It makes sense if you think about it though considering this part of the country is so much closer to Japan than New York is. Don’t get me wrong though, I know we had really great sushi in New York, but it’s certainly possible that the proximity to Japan could help. On this particular evening, I wanted to see just how good really good sushi in SF could be so I wandered over to Hayes Valley to dine at the microscopic sushi spot Domo. This diminutive restaurant serves up serious sushi in a very casual, unpretentious, kind of hipster, but downright pleasant environment. With quiet hip hop beats and a down-dressed Mexican and White hipsters helming the sushi station, this was no ordinary sushi restaurant. It had none of the traditional, ritualistic formality you see so often at sushi joints of this caliber. There’s not many seats so there’s often a wait, but it’s worth it. I sat at the bar and looked over the menu before deciding on a trio of courses I was sure to love. I made sure not to ignore the specials scrawled on the large mirrored wall while making my picks either. 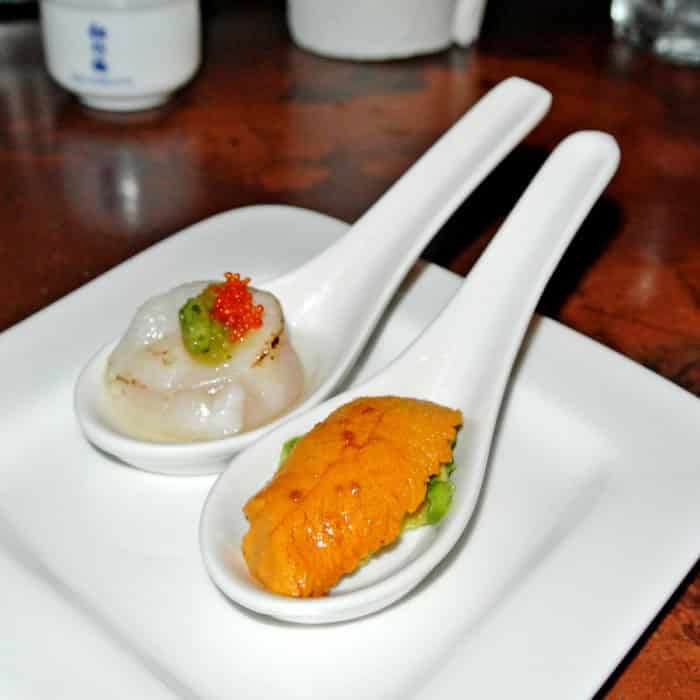 First up was a selection from the Crudo section of the menu in which you get to choose two single serving wonton spoonfuls of seafood bliss for $7. 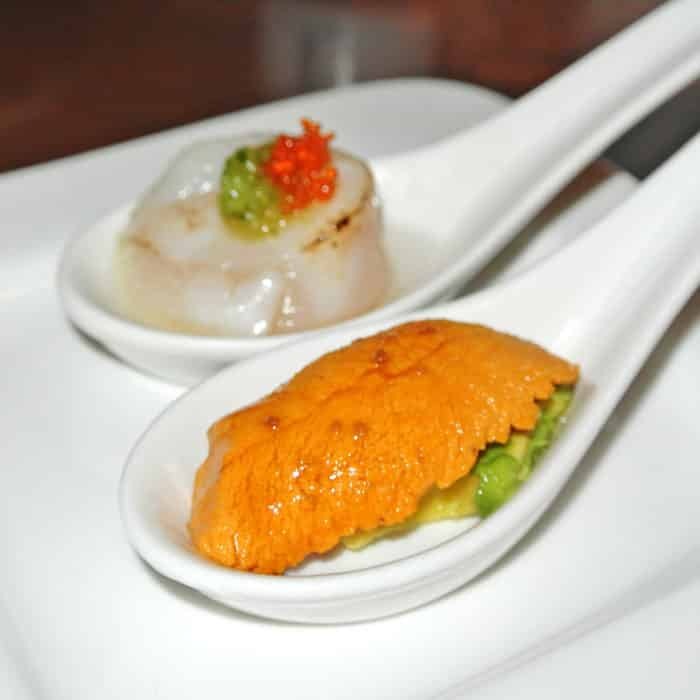 Among the many options, I was drawn to the Scallop and Uni varieties. I started with the scallop crudo, served raw and dressed lightly with yuzu, cucumber, tobiko, rice vinegar, and sea salt. The liquid beneath the scallop was a bit tart and the scallop itself was tender and nicely torch roasted. This was a simply excellent bite to begin my meal. I followed up that spoon with the uni-filled one which was delicately dressed with creamy avocado, wasabi soy, and sea salt. This bite was briny and salty and that squishy uni melted right into the perfectly ripe avocado slice. Once again, another phenomenal single slurp. I followed up my crudos with a maki roll from the specials on the wall: the Negi Toro Roll. You sushi connoisseurs probably already know that Toro is the tender and fatty meat from the belly of the Bluefish Tuna and comes at a premium. 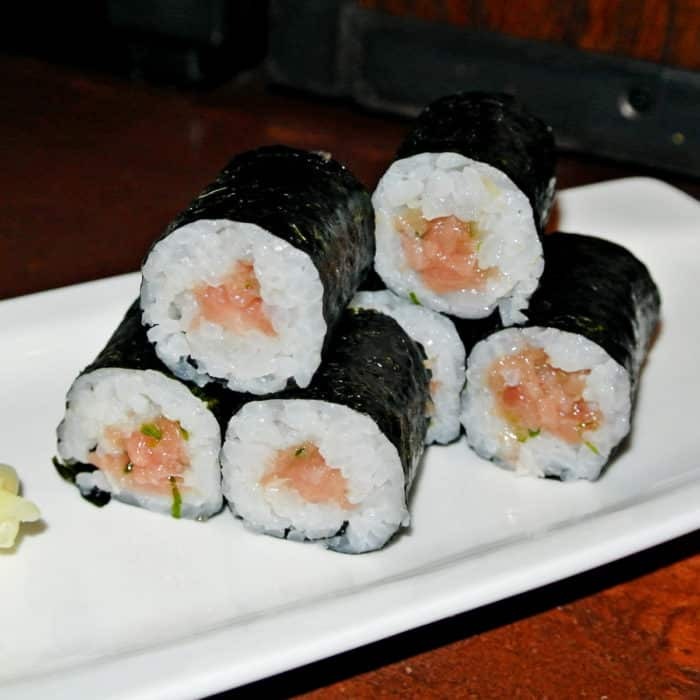 I often enjoy the tender meltiness of this cut of fish and this toro roll was prepared simply and well with a bit of green onion. Ultimately though, when served in this maki format, it didn’t taste much different than a regular Tuna Roll and was probably not worth the extra money it cost for the higher quality fish. I finished up my meal with of pair of the larger, more modern sushi rolls offered beginning with the Daddy Roll, another pick from the specials board. It was filled with tempura green onion, shiso leaf, avocado, and sea trout roe and topped with slices of sea trout. The sushi rice was excellent and the shiso leaf added an herbal quality to the roll that fell somewhere between mint and basil and paired nicely with the rest of the ingredients. The warm, crispy green onion tempura inside was very unique and when combined with that supremely buttery sea trout, it all came together extraordinary well. The final element of my meal was the Castro Roll which was filled with crab and avocado and was topped with salmon, hamachi, maguro, and albacore. 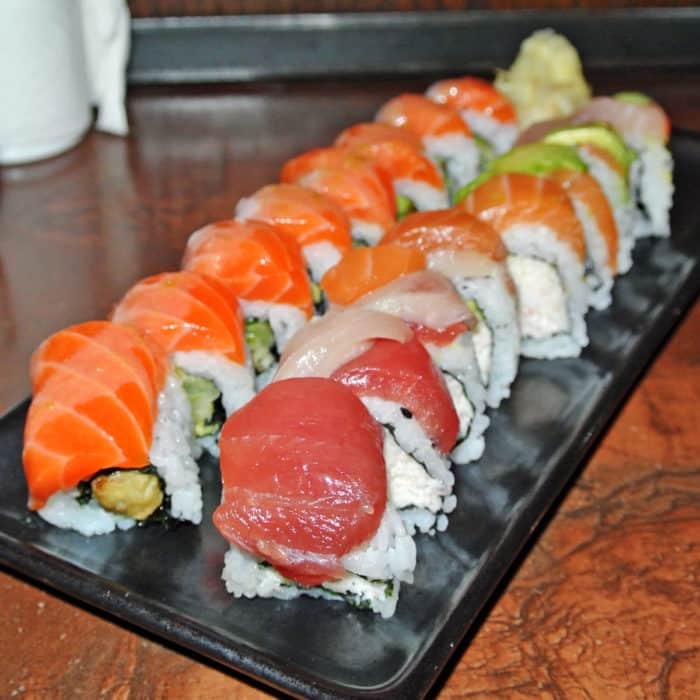 The fish was layered similarly to what’s usually referred to as a Rainbow Roll. Get it? Rainbow Roll → Rainbow → Gayborhood → Castro → Castro Roll. It was filled very generously with sublimely fresh crab meat which was no surprise because San Francisco is after all known for its dungeness crabs. 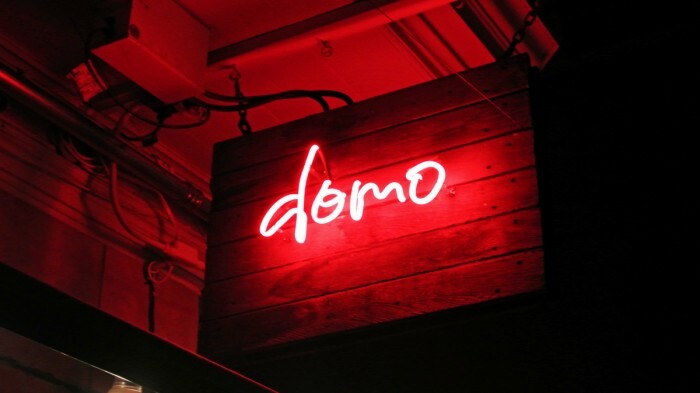 I’m happy to report that there’s no crab stick at Domo, only real crab meat. On top, each piece of sushi was adorned with a different piece of incredibly high quality sliced fish each with it’s own flavor and texture. I loved this aspect of the roll as it allowed me to have a new taste experience with every single incredible bite. 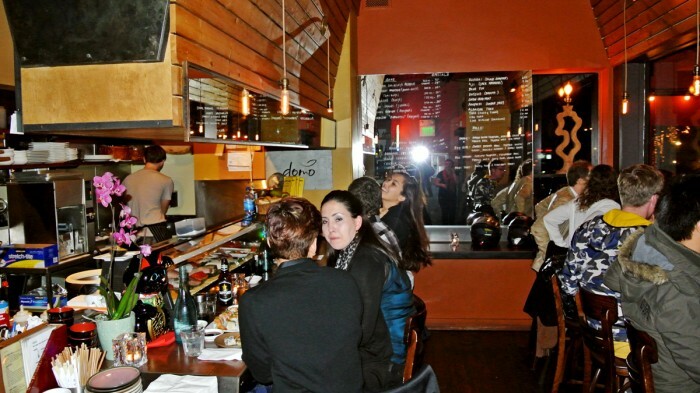 So, if you’re looking for a great dinner or date spot in Hayes Valley, don’t overlook the minuscule sushi haven, Domo. Everything I had was impeccably prepared, incredibly fresh, and just downright delicious. It’s hard to order wrong at Domo though if you do want toro, I’d advise against hiding it inside of a maki roll like I did. 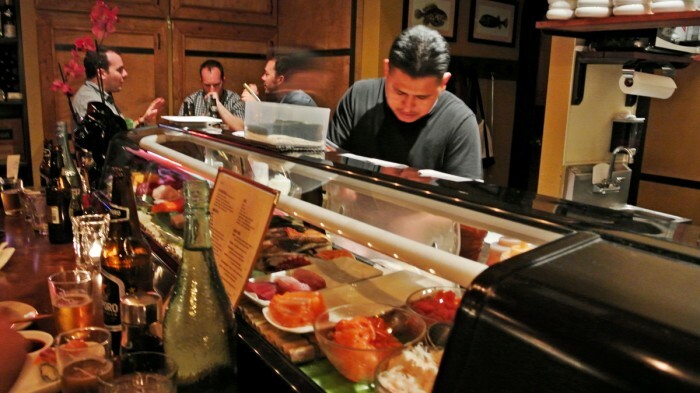 Got another fantastic sushi spot in San Francisco I need to check out? Let me know in the comments below.